Times have indeed changed: for the banking industry in particular, believe it or not, survival is now an act of true grit. As citizens, customers and ‘consumers', there’s simultaneously a sobering cultural dictum and glorious paradox we face here. The very financial institutions we’ve built up, invested in, sunk our money into, bet our life savings and retirement plans on, have become our Achilles heels in times of great need. This isn’t just an infrastructure problem; in fact, the major banks have all the pipes, supply chains and technologies they require. This boils down to a single equivalent: value. Yet value is tethered to this concept we have come to know as money, and money, as we know, is changing face quite profoundly. One of the most popular areas of discussion is virtual currency. Bitcoin is pretty much all you hear about these days when it comes to alternative or cryptocurrencies. Bitcoin is an amazing phenomenon for lots of reasons: it’s quick, it’s direct, and it doesn’t require a bank. However, bitcoin is not the future of money. As network exchanges like Ripple are starting to reveal, people are the future of money. And where people are empowered, value emerges. Let’s start with some history on the nature of money and then posit what the future holds in terms of value. Money originated as a concept as far back as ancient Sumer (third millenium B.C.). Back then, money was used to exchange goods and services. In regions like southern India, textiles and agricultural commodities -- pepper, millets, grain, sugar, etc. -- grew in volume such that merchants engaged in trade with Rome, and in turn, the first mercantile exchanges were formed. Through these exchanges, import/export businesses traded ‘products’ like glass, wine, coral and topaz. Roman currency such as coins were actually comprised of precious metals, like gold. Taxation was created to subsidize infrastructure in the form of roads and ports so that goods and products could be moved around commerce hubs within various city-states. Renaissance commerce came about in the 11th century as societies mobilized and per capita incomes grew. This basically demarked the expansion of hyperlocal economies and central banking centers. Keeping the system ‘in check’ was the fact that producers of goods and merchants operated reputationally, even while bankers acted as middlemen. In fact, there was little to game within the system because value was attributable to who was producing, who was trading and who was brokering, as well as what was being exchanged, and for the most part, everyone had visibility into what was going on in the marketplace. You could say that mercantile exchanges used their own forms of social currency. Reputation, management and exchange had social and cultural edicts guiding them, and businesses had not yet formed as corporations. Plagues and warfare emerged as transactional value became more speculative due to increases in population, and socio-geographic challenges presented monarchies with territorial squabbles. This meant that people (serfs or ‘commoners’) were pitted against each other as they fought over access to natural resources. As this occurred, Dutch, French and German groups started to see that these tensions and their volatility were good for their banking and business interests, because they could make value scarce, and could contain the labor force. So, ‘goods’ and ‘services’ were tied to the ability to distribute and manufacture, but only in limited supply and increased demand. Bankers themselves would hedge the speculative demand, placing bets on price fluctuations and essentially creating ‘profit’ from the perceived future value of the commodity, resource, good or service. To be clear, this ‘value’ was assumed (speculative), simply because the nature of the transaction precluded the laborers from being attached to that value, even though they were producing the goods. This was how neo-feudalism came into prominence; merchants and bankers (and merchant bankers) ruled the commerce landscape, while the people were merely a part of the supply chain. By the time the 15th century came around, Italian city-states saw immense concentrations of wealth due to their commerce and currency capabilities. Savings and loans agencies, most notably Monti di Pieta, formed to designate funds collected for a specific purpose, and to identify them as nonspeculative. The idea was to provide loans at a relatively low rate of interest to small artisans and dealers and to the poor in general, on the pledge of various goods. The interest was used to defray administrative expenses and salaries of employees. While the intent was to stabilize economies and spur growth within the labor sectors, what ended up actually happening was the opposite: these loans became powerful collateralized debt commitments (sound familiar? ), primarily due to the fact that artisans couldn’t keep up with the rate of exchange, and labor couldn’t organize quickly enough to manage supply. Papal interests in Rome -- which at this point had merged Church and State interests -- had acquired an incredible means for control of the ‘commerce ecosystem’. It is important to note that Jewish banking monopolies had formed throughout Europe, but in reality, Jewish and Papal interests (and even Muslim interests) were aligned as they formed a tightly woven network of banks and unions that eventually became central banking cartels. The problem of society and business in terms of capital value. Neofeudalistic levers for the control of trade and commerce remained as the U.S. was colonized by the Brits. America was under a land lease to the English throne, and all tax monies and trade warrants went through the City of London (a corporation). Businesses like farms, plantations and textile factories were set up and a domestic economy prospered, at least for those who had a foothold within the political system. ‘Capital’ became a unit of stock and trade assigned to inventory flows, meaning that if a business could produce enough goods to stock its shelves, it had the assets to have capital value, of which banks and unions could lend and distribute currency. Issues naturally arose as to what those values actually were, especially as labor was commodified in order for businesses to remain competitive. By the 1700s, independent groups formed to tackle the issues associated with social mores (like slavery), as well as conflicting notions of free trade and commerce practices. Ben Franklin’s Junto was created in Philadelphia in order to help the local community solve critical issues such as educational needs, food for the poor, artistic endeavors and merchant protocols. Other junto groups would form over the years to deal with similar socio-economic complexities and cultural explorations. American independence would prove to be a boon for those running communities and secret societies, but as the Civil War rolled around, it would become evident that money, capital and currency could not offset the value of human contribution, and as such, conservative and liberal idealism would grow as mechanisms for control of labor and resources continued to divide constituencies. The Church, which is the state, is now your bank. Back in Rome, papal groups (among them, ‘black’ and ‘white’ nobility) got further and further into the money game. Precious metals, like gold, would back paper currencies (notes) and exchanges would trade both the currencies and the goods delivered through them. Central banking powerhouses such as the Rothschilds -- that have been said to be supported by the Vatican Bank and were commissioned to develop a ‘new monetary system’ -- proliferated in virtually every developed country, issuing a debt currency which was ultimately known as a ‘fractional-reserve note’. These notes were initially issued for storing gold reserves; the bank was essentially a vault that held the asset and would collect a fee to release it at a later date. As time went on, the central bank realized it could move reserves around, buy up its own gold and issue the same notes. This was basically a ‘promise to deliver a promise to deliver’ -- that sounds kind of odd, but it’s true: the bank could lend several times the amount it held in assets, while the country had to commit not only to paying back the loan, but at a fairly high interest rate. In other words, a sovereign government would be drawing down a debt note, but not necessarily an asset. In many instances, this meant that if the cost to produce and distribute was favorable, the debt could easily be repaid. If it wasn’t, the government would draw down even more debt, thinking that ‘at some point’ it would enter a surplus period and all debts would be then be paid off or absolved through offsets. As economies grew, capital fluctuations became more abundant and currency traded at higher risks and higher speculative values, thus sovereign debt would become a major problem because of inflationary and deflationary dynamics. Depending on the level of production, trade and surplus (to include natural resources), countries and their economies would experience bubbles due to the simple fact that debt was being moved around so much. Compounding this was the fact that debt had a significant impact on depositors; in sum, deposits in a bank were just notes for repayment, not money or tender that had a guaranteed asset backing it. Later, insurance guarantors (like the FDIC) would write policies against the issue of notes, but in reality, nothing was collateralized because it was unclear as to what the actual asset base was, and banks were not necessarily under obligation to report on it. In other words, a bank would provide an audit of the notes, but not the assets. This meant that currencies could go into a freefall. Trade would increase to offset currency fluctuations, among other things. Since natural resources could create an elasticity for currencies to accrue some form of value, wars became a major profit center (and a trade proxy) for the central banks. The Rothschilds actually financed both sides of the Napoleonic wars, both the Nazi and allied forces in WWII, as well as supported the formation of the Israeli state in 1948. Why? The short answer was to create volatility in the marketplace, and place trades that would hedge certain predicted (or known) outcomes. This is a much longer, deeply entrenched story about religion, geopolitics and secret power structures, but suffice to say that things like petro-currencies emerged as elastic models for oil pricing and production drove the global financial markets, as well as multinational corporate interests. The Banana Wars were a classic example of how imperialism fueled U.S. and European economic growth leading up to WWII, and also explains why industrialization experienced a boom during this time period (For more related to this, check out the backstory on Smedley Butler). It also helps explain why the long-standing rumors of a banking cabal might actually be true. Right around this time, the U.S. Federal Reserve was set up in 1913 as a private corporation. It would lend fractional-reserve notes or a ‘fiat’ currency on behalf of the U.S. government, but was under no obligation to report its holdings or the accounting practices tied to treasuries (bonds that were used to back government services and infrastructure). Basically, a private entity was running our financial system without any checks and balances, and still is. The U.S. dollar -- a federal reserve debt note -- became the predominant currency in the world, since it was perceived that the Fed held the most gold and the U.S. had the most access to natural resources, oil reserves in particular. The Fed would set interest rates and fix the price on oil, all the while collecting interest on our sovereign debt, which would grow to unprecedented levels in later years, despite periods of ‘surplus’. The Iraqi wars would prove to be one of the most blatant runs on price fixing for elastic oil reserves in modern history. Three years before WWII ended, the Institute for Works of Religion (IOR), or what came to be known as the Vatican Bank, was established in 1942. The Vatican Bank would allegedly grow to an enterprise with over $5bn in assets and gold reserves. Some accounts (and quite a few books) tell how this group would control the global network of central banks such as the BIS (Bank of International Settlements), the IMF (International Monetary Fund) and the World Bank, under the auspice of economic reform and support for many millions of people in need. Irrespective of the circling conspiracy theories, as global citizens, we have a pretty good idea of how things have turned out. More importantly, we’ve realized that money isn’t quite what we think it is. It’s become a faith-based construct leading us to believe that something has value, and will continue to have value in the future. The question is: whose value? The deception of shareholder value. As pressure mounted to stave off the ‘dangers’ of debt accrual shepherded in by the central banks, and the forces of labor, the state and the banks became more and more conjoined, corporations were forced to become lean and mean. Economic booms would still occur and innovations would flourish, but ultimately this would not bode well for the average citizen or the average stockholder, since the ‘markets’ were now heading into a transactional realm that superseded the abilities to produce, distribute and consume. Unions -- arguably a platform to mitigate the problems of labor -- would become corrupted and serve as magnets for organized crime. An odd abatement of labor reform, institutional oppression and cultural blowback would ensue. Value, in myriad forms and exchanges, was being called into question as a follow-up to the cultural revolutions of the 1960s. Value, as a proxy for the notion of prosperity, had become fiercely capitalistic, and far less social as it once was when transactions were reputational. Two catalytic events happened in the 1970s that arguably widened the chasm between business and society. The first was when U.S. President Richard Nixon took the U.S. dollar off of the gold standard, meaning that it cancelled the direct convertibility from the dollar to gold. This was known as the ‘Nixon Shock’ and would stymie the fixed system of exchange rates set up by the 1944 Bretton Woods conference to redeem dollars for gold by the U.S. government at the price of $35.00 per ounce. The U.S. was committed to backing every dollar overseas with gold, while other currencies were fixed to the dollar, and the dollar was pegged to gold. But this meant very little to markets outside of stock, currency and mercantile exchanges, since trade was now stringently regulated by governments and policy coalitions run by private interest groups. This move, intended to stem the pain from rising unemployment and inflation, was a temporary solution to a much larger problem of systemic debt. In short order, it propelled the adoption of a ‘fiat’ currency such that bubbles would become more frequent and more accelerated, but the financial markets would trade it at relative value, rather than one tied to a standardized rate of exchange, and one backed by a real asset. The second event was an emphasis on company performance tied to shareholder value. This basically meant that the duty of a public company was primarily set up to fill the pockets of shareholders at any and all costs -- costs to employees, costs to the environment, and untold costs to human value inside and outside the organization. Stalwarts like Jack Welsh would usher in a whole new era of profitability under the credo of shareholder value, and shortly thereafter, his colleagues and competitors would follow suit, as price-to-earnings ratios, EBITDA and market capitalization would be the pursuits of the day. The dynamics are far more complex than what has been explained here, but between hypertransactional rates of exchange related to the U.S. fiat dollar (nothing really more than paper money) and market capitalizations that had less and less to do with company operations, on the ground market conditions and ethos, money fed the coffers of those ‘in the know’, and as a result, concentrations of wealth would cycle through various bubbles. Cut to today, a stratification of wealth -- the accumulation of stock, currency and resources -- vastly separates the rich from the poor, as the stock market itself has reached an all-time high, while high unemployment rates are masked by low-interest rates and a narrative around ‘quantitative easing’. The grand irony, of course, is the fact that the disintegration of the middle class -- what is effectively our labor, production, supply and consumption pool -- only hurts the growth outlook for companies of all sizes, as the U.S. fiat dollar is being rendered obsolete by the BRICS (Brazil, Russia, India, China and South Africa) in a currency war of sorts. These countries have either insulated their production and trade capabilities to sustain their own GDP growth, forged alliances amongst each other for new free trade agreements, or have found ways to invest in foreign economies (like the U.S.) where they are buying up assets like real estate for cash and sitting on the investments. Among the reasons cited above, many U.S. cities have headed into bankruptcy and have taken on the disposition of third world economies. What will value become now? Money is the idea that something can be exchanged because it has value. Capital is the idea that something can be distributed for a greater value. Currency is the idea that something can be traded for a future value. Credit is the idea that something can traded or exchanged now for the same future value, often times plus interest. None of these concepts denote what value is, and more importantly, what networked value actually looks like. 'Social currency' is a neat idea that suggests people carry value in exchanges of ideas or some form of equal trade; gifts (as in the 'gift economy') have been thought of recently to represent equal exchanges of goods and services sans determinations of value commonly found with money or credit. Alternative currencies were introduced into the mix as a means to offset the risks of a fiat system, and to create direct exchanges that could disintermediate banks… yet we still have the problem of discernible value. A newly minted term -- the 'sharing economy' or 'collaborative consumption' -- makes a similar play on words by talking about how people consume goods and services through distributive means driven by technology, such as mobile apps. 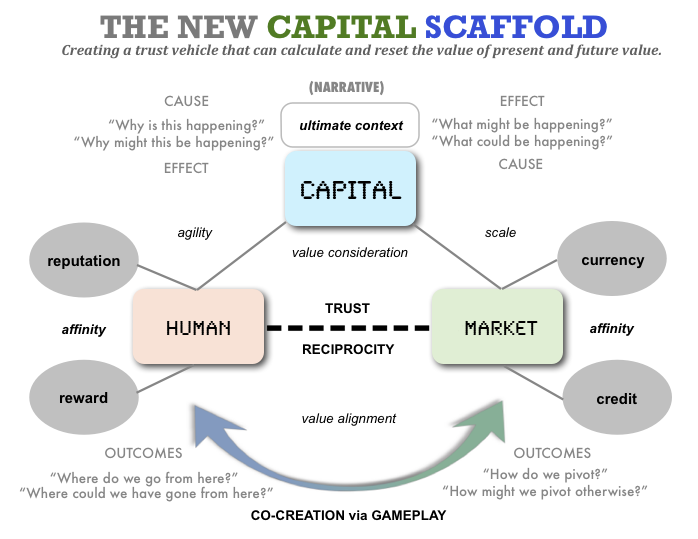 While the mechanics of a 'sharing economy' show how it can disintermediate service providers and disrupt money flows, this does not usually address how perceived value changes, or more importantly, how production creates new value chains when people can collaborate or co-create different ways to make things. In other words, we can find myriad ways to produce, distribute and to consume, as well as provide alternatives for credit and currency, but we cannot assume that some form of value is inherent in the exchange between people unless we know who they are, that we can trust them, we can observe their intentions, and that we can build a relationship on top of that trust and intentionality. Think of the early merchants and mercantile exchanges that existed before corporations, for lateral historical context. Which brings us to peer-to-peer exchanges. P2P groups, federated coalitions if you will, have formed to not only explore what value means when things are exchanged directly, but how production, distribution and collaboration create more reliable forms of value exchange. The challenge here is one that pits a 'new' paradigm of moneyless thinking against the 'old' paradigm of money-driven exchange. And where the gaps lie, notions of value remain. You might ask: How does one 'standardize' value in a human network that is at once complex and often ethereal in its actions and behaviors? Is it simply a matter of metadata? But if that's the case, then what becomes of value in the moment, or relative to a concurrent series of moments in a network, as modes of exchange go down in a rapid-fire way (such as the case with microtrading on a stock exchange)? It would seem that the people conducting the exchange, its mode and its distribution points (the nodes in a network) are keys to discovering some of the answers. Cryptocurrencies, like Bitcoin, present another layer of complexity to the idea of value in that security is used to anonymize the modes of exchange. In a world in which privacy, piracy and surveillance are fear-based realities of how information flows, digital and alternative currencies find themselves in rudderless territory. To boot, in the U.S. they are being traded and speculatively valued against fiat dollars. Surely, this new marketplace can't have legs knowing what we know now about the financial markets. The recent Chinese ban on Bitcoin exchanges is just one signifier. More promising are network exchanges that are trading real assets, such as Ripple Singapore. Crowdfunding is another dark horse in the race for alternative solutions. While it has proven to be an incredible marketing vehicle, and equity crowdfunding is experiencing a groundswell of new investments and respective models, it is still not a fully viable way to make accredited investments. Regulators (like FINRA or the European Commission) do not have the policies to match the investment, or in some cases, currency classifications. Equities and preferred share allocations (like options) are subject to strict regulatory protocols and for good reason: they can be gamed, backdated or inflated. Crowdfunding and cryptocurrencies have yet to present a means for addressing these issues definitely, and banks are skittish to jump into the fray given the increased scrutiny they've brought upon themselves. But, things are looking up nonetheless. There's a psychology to money and value that must be observed closely, as it's been an integral part of our social engineering for centuries. The problem of economics, as we've come to understand it, isn't so much related to a new monetary system as it is in how value drives the modes of production and exchange. Yet we still struggle over what value actually is; our fear-based culture listens to narratives such as the ‘fiscal cliff’ and ‘sequestration’ and ‘quantitative easing’ to quell concerns and somehow shape behaviors so that people will still consume and borrow. In many ways, we’ve commodified consumption and lending as services perceived as valuable, if not sent them into oblivion with the public trust. But there is a silver lining to all of this. Perhaps we can help ourselves explore this by running through a scenario in which producers, distributors and traders are all identifiable within the same ecosystem, and through which real relationships can be developed in the experiences of exchange. Let’s call this “Bill’s Agri-System”. Bill grows corn. Bill has associated costs to cultivate and get his crop to suppliers. There is a standard to measure in his production of the crop and its distribution in that Bill’s costs are amortized according to time (crop yield window), agent (who is best suited to supply it) and hub (who is best suited to sell it based on factors like pricing). These elements represent the crop’s present value, to include the people and organizations involved, and their reputations based on quality, high standards for protocol, treatment of employees, etc. Bill can only supply to people he trusts, and suppliers can only deal with retailers who are trusted to sell products (produce) that people want. Bill’s crop may not always go directly to local supermarkets like Whole Foods or retailers like Wal-Mart. There are likely several steps in between the yield and when a product goes to market; corn can be turned into maze and used for other food products, or processed and turned into ethanol for energy consumption, to cite two examples. In these cases, Bill’s crop has transferable value, which would place a value or set of values on the processes that bring the crop as a product into market, again to include the people and organizations involved, and their reputations based on the care, diligence and qualities they imbue. A third component to this is storage value. This is where alternative or cryptocurrencies come into play. If a Bitcoin is used to represent either present value, transferable value, or both, people within a marketplace can make direct exchanges knowing that the value is neither inflated nor gamed, because the nature of the transaction is contingent upon the variables resident within the forms of value -- effectively, the modes for production and distribution, and again, the people involved. In the case of a tradeable commodity, such as a future, a bank can make a trade if it so wishes, but it can only speculate on the value represented in the currency itself, not the speculation that the market imposes upon it -- what amounts to the ‘story’ that analysts tell the banks and their trading desks. If a bank doubles down on that trade (hedges it), only it can be responsible for the risk, not the farmer or the consumer or the government issuing a subsidy or bond. A little known story is that this scenario played out in the Brazilian Mercado several years ago. In short, the country had fallen deep into a recession and could not attract outside investment, and couldn’t continue to borrow from its central bank, so it used Bitcoins as collateral against its own farming subsidies -- in other words, its crop yield had a currency backing it, and vice versa. Within 18 months, farmers could grow more crops, suppliers could distribute more product, retailers could sell more inventory, traders could trade real stocks and commodities, and the economy was revitalized from the bottom up. Well, for the time being. The role of policy going forward. Regulation, governance and legislation have a funny way of at once managing and stifling markets. This is the bane of modern capitalism, which endeavors to transact at any cost. In the case of what can be coined as a ‘transitional economy’, policy is now becoming the rule of the day. Yet neither Washington nor Wall Street are very good at creating it, or keeping to it, and corporations -- many of which are are buying up producers and distributors -- are way too focused on improving their margins in a down market so that they demonstrate exceptional ‘shareholder value’. So it seems that policy innovation and economic innovation are inextricably linked. Technology has a heavy hand in this, but it must be careful not to relegate the human network element to back rooms and boardrooms, where opacity is the method of trust and information exchange. As those of us at C-PET see it, all players in the ecosystem have a huge opportunity to work together and create new markets. The question remains as to whether we are willing to divorce ourselves from the old, paradigmatic notions of money and value. We’re ready to play. Are you? About the author: Gunther Sonnenfeld is a Managing Director of C-PET Futures Platform, an initiative for emerging technology policy innovation, and a Partner in K5 Ventures, a Southern California startup accelerator, with recent co-investments that include the much hyped Coin. Over his 18-year career, Gunther has co-developed over a dozen technologies that have gone to market in the social media, business intelligence, content distribution and advanced analytics spaces, including Heardable, eCairn and Paperlet.